What is the Insulation Removal Services Process? Insulation removal services include the extraction and removal of old or new fiberglass, cellulose fiber and polyester batt insulation. Once removed, the area is cleaned free of all remaining dirt, debris and dust. If we find a few rodents and other pests living in your home rent free, we’ll show them the door! Once the area is cleaned and properly prepped, we can begin to install the attic insulation choice you made previously. With a clean slate to work with, it makes the installation of your product a lot easier and insures that you are getting the top notch product in your home. Why Choose Our Company for Insulation Removal Services? ATX Radiant Barrier & Insulation specializes in installation of new blown-in insulation and removal of old, toxic and damaged insulation. Proper machinery is used to ensure safe quality service and maintain health standards, limiting insulation from getting into your livable home space, thus preventing further contamination from airborne fiberglass particles and other toxic matter. 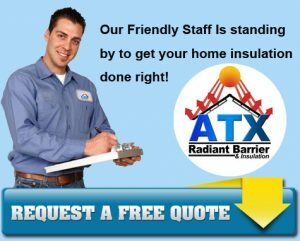 ATX Radiant Barrier & Insulation is an Austin, Texas, based insulation company that services Austin and the surrounding areas. We are family owned and operated holding your family’s needs to the same care as we do our own. With over 40 years of experience in HVAC and Preventative Maintenance Programs we are available to help you. Please call to verify we service your area and to schedule a free energy analysis and/or insulation removal estimate. Thank you for your business!